Wondering the best way to finish homogenizing CBD tincture in 60% alcohol. Was mixed at the extraction lab, but not fully. Have only a small amount(about 5 gallons)…this year… Any easy way to get the last bit of extra homogenized into solution? Also, any good suggestions for getting it mixed right next time…extract and alcohol(different proof, add emulsifiers?). 95% Ethanol should dissolve your cannabinoids entirely. extracting with 95% (190proof) means you never have to dissolve to make tincture. nor homogenize more than a quick stir. not sure how to deal with 60%. that which is not going in, is not going in. what you need to figure out is what IS it that is not going in. if it was THC, I’d suggest a bioassay on the ppt. then test a little to see if it dissolves in 190. @Photon_noir might know how much water it takes to start louching CBD. Yep. 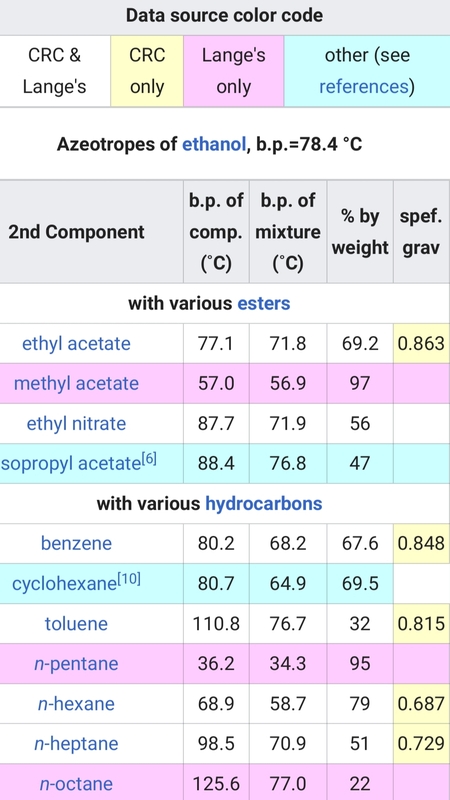 As soon as you add water in excess of the azeotrope (iow, more than about 5% by weight) any pure ethanol:water mixture begins losing its resin solvating power very quickly. Using 151, 60%, vodka, or anything more watery than 190 proof will require a lot more of the solvent to extract the cannabinoid resin. Louching, the process of un-dissolving resin from 190 proof, in particular, depends on how much resin is dissolved in the 190 proof in the first place; higher resin concentration requires less excess water to begin precipitation of the milky microemulsion. At typical 190 proof multi-batch extraction concentrations of resin, adding just 5% excess water louches all of the resin out. Thanks Photon! Seems like some solid info I will have somebody help me translate for my next batch. In the meantime, am I stuck with undissolved splotches of resin(?) or is there something simple I can do to homogenize it more before I bottle it up? Heat and Stir? My intention is that it is in its finished state right now. Appreciate your input. Please dumb it down for the novice, if possible. Thanks!! Thanks, man! I’ll read up. I thought I had done that already, but @ShearGuy has a better answer for you! 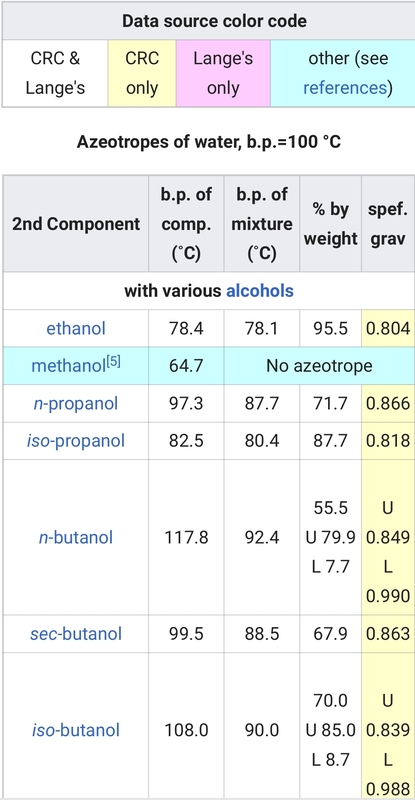 That said, also understand that drinkable 190 proof ethanol and n-heptane denatured ethanol are very different animals. I strongly advise people to reclaim and reuse solvent as much as possible, rather than just buy cheaper solvent. 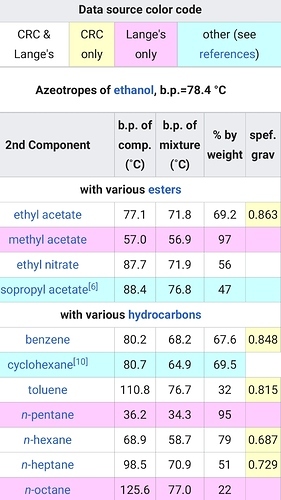 It makes a world of difference to use and reuse potable 190 proof, compared to trying to re-use heptane-denatured after it starts forming the ternary azeotrope with water. A. The ternary (3-part) azeotrope of [n-heptane : ethanol : water] forms at least a binary (2-layer) set of solutions, each with different ratios of all 3 components, and thereby different densities (which generates 2 totally different layers of solvent, each comprising about 50% of the total volume). B. 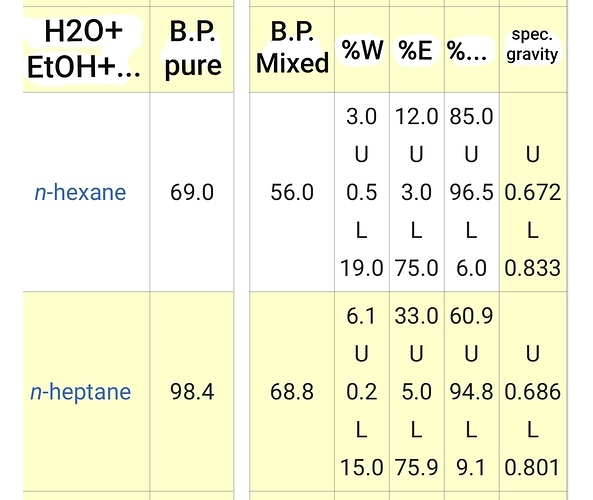 The heptane in the azeotrope not only screws with the consistency of the solution, but also extracts more undesirable stuff from the plant matter… both on its own, and in the variable ratios with ethanol and the inevitable water. @Future , I don’t know if there is a better database in which to enter this errata, but it does happen, as @cyclopath can attest. 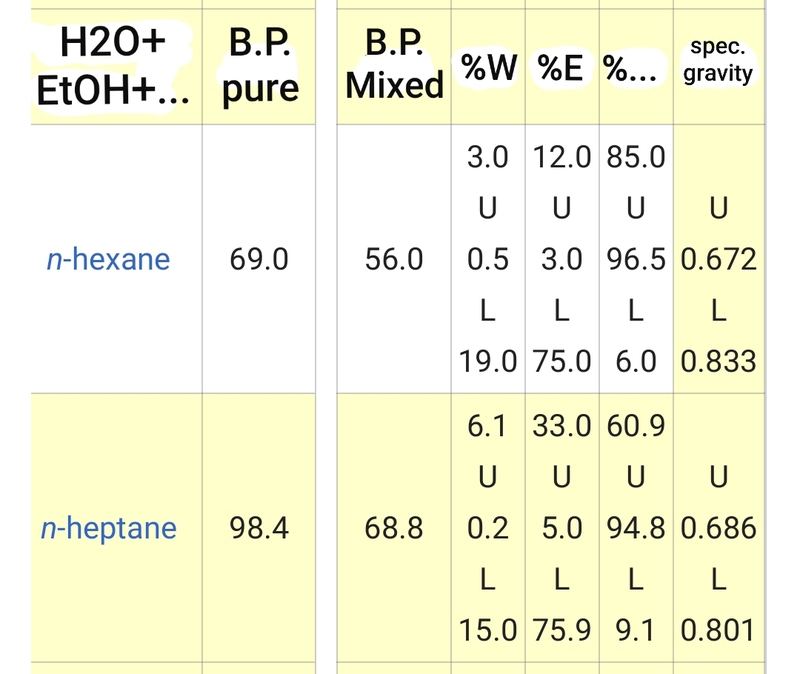 I included the n-hexane ternary, also, for reference. Any questions? Should I move this or make it a new thread somewhere, @Future or @sidco? Moving to a new thread? Your call. As for me, I don’t have the knowledge to translate that info. I wish I did and I appreciate you sharing your knowledge. What I’m going to need to know for this coming fall, is how to mix my CBD extract with alcohol to get a palatable tincture. I’m sure this info sheds light on that, but I can’t translate. Shearguy’s answer has important info as well, but all I read from that is, I need to dissolve my extract in 190 proof for it to completely homogenize…who’s going to want to put that under their tongue? That’s why I went with a lower proof alcohol…and hence the non-homegnization. I think I need to read up on the threads he suggested dealing with THC and CBD Water Soluble. Unless you can give me an answer in layman’s terms… Again, Thanks!! Far better than ethanol for under the tongue tinctures would be vegetable glycerin or propylene glycol, which are popular with the vape juice crowd. For emulsification rather than dissolution, emulsifiers such as the polysorbates combined with high shear or ultrasonic homogenization will yield a stable emulsion. I made a new thread for it, trying to explain more simply, but it was not about making edible tinctures, just alcohol for extraction. Here is a relevant patent dealing with CBD into ethanol. 10,085,965 It seems awfully broad in its claims, but somebody had the good sense to take it to the patent office and see if they would issue a patent. There are dozens of recently issue patents is the cannabis field. It’s going to be a minefield. There’s really no need to add surfactants when processing CBD extracts with Vegetable Glycerin or Proplene Glycol to achieve a stable emulsion, up to 120 days. The constituents have to be processed in a certain way.